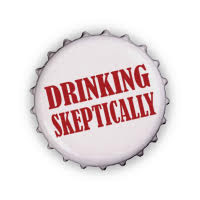 Drinking Skeptically in MD and VA (New Time)! This lecture will introduce some of the most interesting and important questions historians of the American Civil War are asking today. These include: what role did slaves themselves play in the end of slavery? How did the Union Army defeat the Confederacy and win the war? It will also debunk some persistent myths that sometimes overshadow these real questions, including the claim that the Confederacy fought for states' rights rather than for the perpetuation of slavery. Even if you have never given a thought to the Civil War, you will come away from this lecture able to discuss and debate this defining moment in US history. 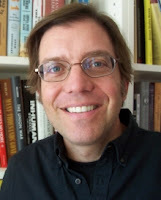 Andrew Zimmerman is Professor of History and International Affairs in the Department of History at The George Washington University. Professor Zimmerman received his BA in history from the University of California, Los Angeles, his M.Phil. in history and the philosophy of science from Darwin College, Cambridge University, and his PhD in history from the University of California, San Diego. He has also studied at Humboldt- Universität in Berlin and at Universität Wien in Vienna. Professor Zimmerman's research focuses on modern Germany, the United States, and West Africa. He is working on a project tentatively titled "Slaves and Soldiers in the Red and Black Atlantic: A Transnational and Revolutionary History of the American Civil War." Library customers can get 2 hours of free parking when they park in one of the Rockville Town Square garages, which are clearly labeled Garage A (letter A in green - accessible from Maryland Avenue entrance near Beall Avenue and from Hungerford Drive), Garage B (letter B in blue - accessible from the driveway between Gold's Gym and American Tap Room), and Garage C.
Please note that there are two garages accessible from the driveway between Gold's Gym and American Tap Room. The first garage to the left after driving between the buildings does not have validated parking. Please continue past the first parking entrance on the left and down the hill under the blue sign that says Garage B to access the garage for which parking can be validated. To validate your parking when visiting the Rockville Memorial Library building, use the machine to the left as you enter the first floor internal doors of the Library. The validation machine is next to the Internet Sign In Station. Professor Walter F. Rowe (Department of Forensic Sciences at The George Washington University) will present "Forensic Follies: The Dark Side of CSI." Forensic science enjoys an excellent reputation on television. TV shows such as Forensic Files, CSI and Bones laud the science and the scientists. However, in the real world, forensic science is facing an existential crisis. Cases continue to come to light in which convictions were obtained by pseudo-science, by faked science or by science incorrectly applied. The victims of these miscarriages of justice have often languished in prison for decades. In one case an innocent man was executed because a fire investigator erroneously concluded an accidental fire was the result of arson. This presentation will explore examples of bad forensic science in order to identify the causes of these miscarriages of justice. It will also examine current efforts at the federal level to improve forensic science.. Saturday, December 12 at 1:30 pm at National Science Foundation. 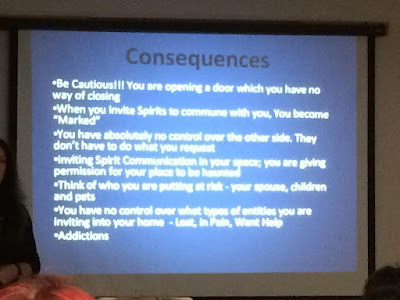 During their two-hour presentation to an audience of about 30 (half of which were youngsters, probably of average age 8 or 9), the Trackers described their use of "Ghost Boxes" when attempting to record "spirit voices," and explained what the boxes are. Ghost Boxes are typically AM/FM radios that have had their frequency scanning feature modified to perpetuate the scan instead of stopping at a well-received station. Apparently these devices are popular in the "ghost-hunting" community because, as might be expected, most haunted places are sonically boring. Recording for hours will only capture floors creaking and climate control systems circulating air, so ghost hunters rely on Ghost Boxes to inject sounds into the boring environment. The resulting gibberish is fodder for pareidolia, which the Maryland Ghost Trackers are familiar with, but apparently don't sufficiently appreciate. And for haunted sites that don't get good radio reception, the Trackers use "EchoVox...a real time amplified recording system used to create a bed of random chaotic noise using random phonetics, microphone input and a natural loop recording echo." Reporter Bottalico omitted any mention of the Ghost Box, misleading her readers into believing that the source of the sounds that the Trackers recorded was a mystery. For their part, the Maryland Ghost Trackers refuse payment for their services and appear to be sincere investigators. They're wary of accepting photographic "orbs" as paranormal evidence (correctly categorizing them as camera flash illuminated airborne dust, flying insects, lens surface droplets, and so forth) but succumb to confirmation bias when interpreting the Ghost Box gibberish. They can guard against that by having each of their team members independently try to decipher the recorded sounds and, more importantly, listen to the gibberish in isolation from every preceding question posed to the "spirits" by the Trackers. This could be worthwhile for minimizing interpretive preconceptions produced by the question. Also of interest is what percentage of the recordings are hopeless gibberish. I asked this during Q&A, explaining that there's a natural tendency to highlight the interpreted recordings and ignore the nonsensical ones. Are there many more nonsensical ones? The Trackers couldn't be sure. One guessed that about 50% of the recordings are "coherent." Based on that concern, and seeing an opportunity for enthusiastic (if misguided) youngsters and their parents to get a more scientific view of these interesting questions, I prepared a handout with useful resources (a Ben Radford critique of ghost hunting, a James Randi Educational Foundation test of electromagnetic field meters as used by ghost hunters, and a Richard Wiseman piece on hauntings) for anyone who might be interested. About half of the adults took one, as did the Trackers, who graciously allowed me to announce its availability. "Testing the Validity of the Ghost Box as a Tool for Paranormal Investigation"
At about 11:30 AM on Friday, October 2, 2015, NCAS board member Scott Snell of Greenbelt, Maryland unexpectedly encountered fellow board members Chip and Grace Denman of Silver Spring, Maryland on a trail in Taughannock Falls State Park, New York! It was an entertaining and intriguing experience for all, especially when first seeing the other(s) in the distance, wondering if it was actually who it seemed to be, and then becoming certain of it. We "compared notes" of how we got to the same place at the same time and found no mutual factors (except for seeing the spectacular falls, of course). The Denmans visit the area every few years or so, not far from Chip's alma mater. They scheduled this trip around their work schedules and hotel availability, months in advance. I (Scott) was there for the first time, for my nephew's outdoor wedding the following day. He and his fiancée had started dating in a previous early October, so they wanted their wedding to occur then too. As it turned out, their reception venue wasn't available for the preferred weekend, and the earlier date would probably offer warmer weather, so they shifted to the first October weekend. I'd arrived very early Friday morning, slept in late, grabbed a quick bite, and made the short stroll from my nearby inn to have a look at the Falls before driving to Ithaca for the rest of the day. The weather that day (cool, overcast) wasn't especially welcoming, making the outdoor encounter a little less likely than it would've been for a warm sunny day, I suppose. And the leaves hadn't even turned to autumn colors yet. As I wrote in another entry about coincidences (the January 2013 Shadow of a Doubt), "We're surrounded by an incredible number of occurrences and details, only some of which we even notice, so we should expect some random 'alignments' of two to happen now and then. We never notice the many misalignments, so when an alignment occurs, it seems remarkable, and could be quite affecting." Indeed it was! When holiday shopping at smile.amazon.com, you'll find the same low prices, vast selection, and convenient shopping experience as Amazon.com, with the added bonus that a portion of the purchase price (0.5%) goes to NCAS! It's simple and automatic, and it doesn't cost you anything! AmazonSmile's disbursements to NCAS in the first half of 2015 came to $15.40, meaning that over $3000 of purchases were designated in support of NCAS. (As an example of how NCAS can put that money to good use, it's almost enough to cover one hour of the Bethesda Library lecture room rental: $20). Drinking Skeptically in MD and VA (New Start Time)! The Washingtonian magazine list of the best 75 DC-area bars (2013) includes Jackie's Sidebar: "Insider tip: Sop up the spirits with some of the best bar snacks around. We love the Chicago-style dog and grilled-seaweed-sprinkled popcorn."